The dubbed series follows the on and off court adventures of Ryoma Echizen, the 12-year-old son of a famous tennis player and a prodigy in his own right. Looking to make a mark, he joins his junior high school tennis team, known as one of the most competitive in Japan. Ryoma is cool and collected – some might say he’s cocky – but he’s got the skills to back up his attitude, with a virtually un-returnable “twist serve,â€ and quickly defeats numerous upperclassmen to secure himself a first string spot on the team. With talent in his blood and fire in his eyes, he backs up his confidence on the court with amazing skills. Now he has to overcome the older players on his high school team who are dead set against letting him surpass them. To defeat the slippery “Viper” Kaido, the calculating Sadahara Inui, and a host of other opponents, Ryoma will need everything he’s gotten from his father and more! 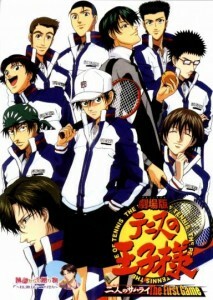 The Prince of Tennis is a smash hit phenomenon in its native Japan, and a must for all manga and anime fans out there.